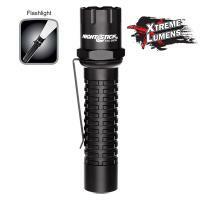 This compact non-rechargeable metal Xtreme Lumens tactical flashlight uses a CREE® LED rated at 500 lumens that works in conjunction with a high-efficiency deep parabolic reflector to create a usable beam rated at 150 meters. The tail-cap switch provides momentary or constant-on functionality. The housing and tail-cap are made from aircraft-grade 6061-T6 aluminum and have a Type III hard anodized finish. Power comes from a pair of included CR-123 Lithium batteries.